I remember having a flood of emotions. I was elated, anxious and a little overwhelmed. I understand that such conflicting feelings about pregnancy are not so unusual, we all go through it. Bringing your new baby home is an exciting and wonderful experience, very rewarding too. Sometimes, words cannot describe it! 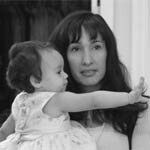 I have put together a list of essentials, which include: resources, products and services that I've found helpful during my pregnancy and after the birth of Mireya and Gabriel. I have organized these selections by topic (links located on the right column). But the story does not stop here. Visit often because I will be constantly adding new information, product details, articles and other relevant information. Of course, we can't possibly buy all the products placed on the market, for obvious economic reasons and to avoid over indulge and spoil the kids. Here I include some great ideas and good finds that would be nice to have. Recent studies have found that several popular baby bottles and pacifiers can leach out of plastic potentially harmful levels of a toxic chemical, bisphenol A.
Bisphenol-A, also known as BPA, is used in manufacturing plastic consumer products, like food and drink packaging. BPA (identifiable by the #7 in the recycling triangle) has been found to cause neurological and hormonal damage to laboratory animals. Independent laboratory studies have determined that five of the biggest baby bottle manufactures -- Avent, Dr. Brown's, Evenflo, Gerber and Playtex -- leached BPA at harmful levels. Use glass or BPA-free plastic baby bottles. Look for baby bottle brands like: Born Free (www.newbornfree.com), Medela, and Nuture Pure. Warm milk in a bowl of hot water, or use bottle warmers, instead of a microwave. Amazon.com's offers BPA-free water bottles, baby bottles, and sippy cups. Now there is an easy way to clean toys. Forget about washing toys in hot water, soaking in vinegar and water or using disinfecting wipes. The Germ Guarding kills germs with dry heat without chemicals. 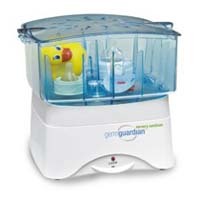 You can use the sanitizer on both hard and plush toys, as well as pacifiers, bottles and even breast pump attachments. The sanitizer automatically shuts off when the 30 minute cycle is completed, maybe too long for my satisfaction, but still a great buy. Finding the right nursing bra can be a challenge, with a good deal of trial and error. I was pleasantly surprise to learn that La Leche League now offers a selection of lovely and comfortable nursing bras. Make sure to invest in a good hands free pumping bra like the Easy Expression Bustier, it will allow your hands to be free to do other things like work on your computer, read a magazine	and talk on the phone. In my quest to be "green" I have been buying more organics and environmental-friendly products. So, when I saw a magazine blurb about the gDiapers I was curious and decided to visit their web site. Of course, I was reminded about the facts, 50 million disposable diapers enter the landfill every DAY and it can take between 200-500 years for a single diaper to biodegrade, while gDiapers takes approximately 50 - 150 days. 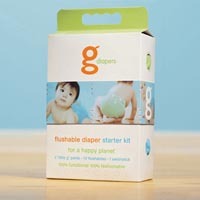 The biodegradable and flushable gDiapers seems like a perfect alternative to disposable diapers. Update: I ordered the starter kit and few extra pants. Well, like any other effort to be environmentally conscious, these diapers require a little more work, but they are indeed flushable! Keep track of your pregnancy with personalized online calendars. Get day-to-day facts, tips and information about every aspect of pregnancy. Get updates on how your baby is growing, as well as how your body is changing. My favorites ones are the WebMd Pregnancy Calendar and the BabyCenter.com Timeline, few others included below. In addition to books and online resources, TV shows are also a good source of information. A picture is worth more than a thousand words! The Discovery Health Channel produces and broadcasts a wide variety of television programs of relevance, from baby room decor to birth and delivery (Birth Day, Babies: Special Deliver, etc.) All very helpful and informative. Also, don't forget about magazines providing information about hundreds of topics relating to pregnancy and childcare: American Baby, Baby Talk, FitPregnancy and Parents. My name is Magaly Rivera, I'm currently living in Georgia, USA. I'm a mother of two wonderful children and just starting the wonderful journey to parenthood. Since their arrival I have been sharing my experiences with family and friends. After sending the same information over and over, I decided to compile all my notes, and that's how I started this site. I do not claim to be an expert by any means. I'm sharing my experiences as I learn and grow with my children. I have enjoyed the journey thus far. I'm excited and look forward to what's in store for the years ahead. Your feedback, comments and suggestions are always welcome. Web site launched on 11/28/2005.